Manu of Manu’s menu Tagged me in this challenge that has been going around my favorite blogs lately. Manu has a wonderful blog where she shares amazing and authentic italian recipes, she is a fellow daring cook and a wonderfully sweet person.Thank you Manu for tagging me and please take the time to visit her blog..it is amazing. The blogger who is nominated must publish his/her 7 links of his/her own blog for the categories below (Only one link for each category). The blogger then nominates up to 5 more bloggers to take part in the challenge and it goes on. I really didn’t expect people to welcome a potato pizza, but not only did get some amazing comments but it went on Food buzz’s top 9 posts! You ladies are too kind and I am honored by your awards..Please take the time to visit their wonderful blogs. Posted in Uncategorized and tagged blogging, food blogging, recipe round up, seven link challenge. Bookmark the permalink. Excellent choices! It all looks so wonderful! Love the car! Oh Congrats and great round up! I like a nice list like summary and categories… Favourite kind of posting! I am so pleased to see this. I love your picks and was just telling someone about your potato pizza recipe today. That car cake is too awesome. The beautiful post is beautiful, but scrolling down it’s clearly got lots of competition. Great round up. I was just tagged by somebody and have to think about my links. I will not be able o match these that’s for sure. Enjoyed going through your blog journey! Loved the potato pizza with roasted onion and pepper. I am going to try it one of these days! And I loved your apple containers for the DB challenge! Thanks again for tagging me. Will put up my post on the 7 links soon! I am so glad I tagged you as I have seen some recipes you had published before I started following your blog and I am so glad I did! They are fantastic!!! Great 7 links!!! Well done! I love the post your are most proud of…there is something about that first post. And I’m glad you reminded me of those Lebanese meat pies. I have to pick Lebanon soon. Now, I’m off to visit your layered mango and orange cake. YUM! Wow, you have such team spirit! I approached this with some dread when I got tagged. On the other side, however, it is nice to see some entries that I haven’t had a chance to see yet. Those fritters look amazing. Just discovered some of the more interesting uses of cauliflower recently. And of course, congrats on all the awards you received! What a great round up of your 7 links! Congrats on your awards and thanks so much for tagging me in this! I’m thinking about it already….. And all those posts of yours I get to see, the potato pizza and mango cake sound amazing, going to check them out now!! I am glad that i got to know more about your blogs with this 7 links challenge. The checkerboard cookies looks really cute and creatively done. And the fritters, ahhh! I love the look of those fritters. It feels like I almost want to pick them up and won’t stop eating, haha! Thank you, Sawsan for sharing these wonderful dishes. oh wowee- ur recipes are a treasure – I especially loved the checker board cookies- gotta try that one ! Your photos are just so gorgeous Sawsan! Thanks for sharing all of these previous posts. 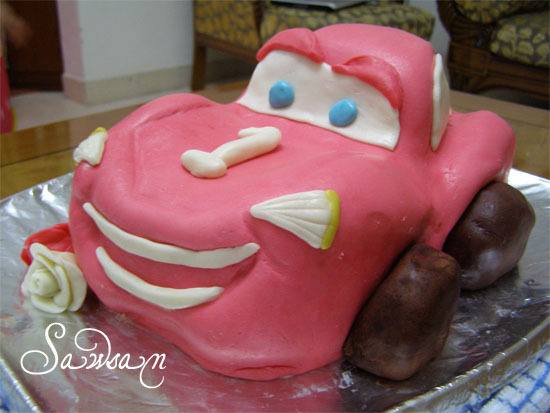 That lightening mcqueen cake is adorable. Love! Oh wow, I had to go back and read your red bean rice salad – does this mean you’ve accumulated all those recipes only since Feb this year?? I looked over them all and thought ‘well, maybe when I’ve been doing this a few years I’ll have a collection like that’, then to be proved wrong. Thank you so much for tagging me Sawsan! I’m very tempted to give this a go (and make those checkerboard cookies, how cool). Sawsan, I thought I would know all of your 7 links but I realized I didn’t know some of your posts in the beginning. Potato pizza is my favorite of yours and so as cauliflower fritters. I really like enjoying your old posts this time.